I am not looking to make this a flame-post, it's clear to me that this game has been crafted by people who really know the lore and have a passion for what they created. I am posting this in the feedback section of the forum as I have seen many people commend the devs for their attention to feedback. With that out of the way, the impression I have after getting the Alpha version of the game on Steam yesterday is that the level progression for this game is BRUTAL. I saw some videos on new level systems and whatnot, not sure what they used to use but dear lord I have done so many missions and I'm still at level 3 or 4? I can't do any of the levels that progress me up because I keep getting junk loot drops and skill points are very seldom seen. The addicting part of RPG's is leveling your character, seeing them become noticeably more powerful as you defeat enemies and improve your skills and gear. With the current leveling system in place I don't see this being a game people can commit to, as there is just no dragon to chase. 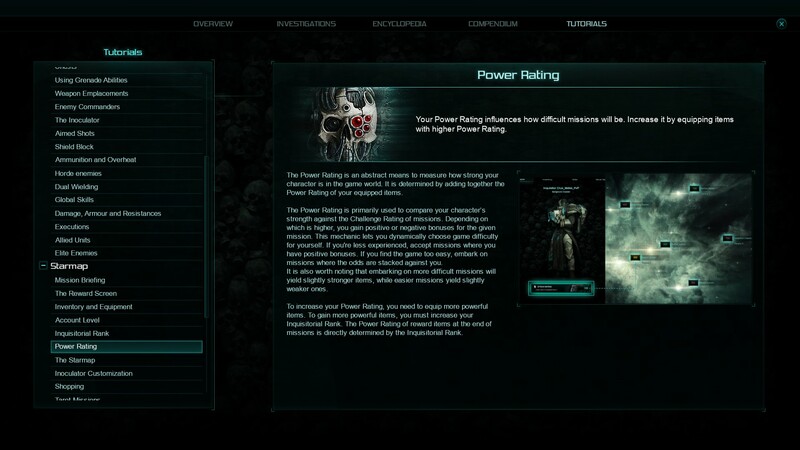 Example: I have a heavy weapons crusader who I was enjoying quite a bit. I would really love to use a heavy weapon besides the flamer (the walking backwards attack doesn't work btw, stops every step) so I bought the blueprints for a Plasma Cannon, only to see I need to be level 10 to use it! At the rate this is going, I will not see level 10 for a week of playing this game in every minute of my spare time. It honestly made me feel that it wasn't worth it. I hope there is something in the works to change the rate at which characters level up, or perhaps some guidance on what missions I should be doing to level my character faster. I did a purple mission rated at 125, the next was 200 and when I tried to tackle it with a rating of ~155 I just got murdered--I know that may be a low level to try the mission but I wanted SOMETHING to happen rather than rinse and repeat the same generic missions over and over again. Great game, but please give players some incentive to keep coming back. as a tip for finding missions, you really need to stick to something as close to your own number as much as you can. Until you are very comfortable with the game. Always keep an eye on all the missions in an area. As for the rate it takes to get account levels - Me thinks its slower than they were expecting, honestly. Likely it was a miscalculation on their part. There is no reason it should take 15 missions at "normal" difficulty (your own level missions) to get a skill point :D - clearly just a calculation blunder me thinks! - wouldn't sweat it tho, will probably be changed next patch. I believe the leveling system is fine. 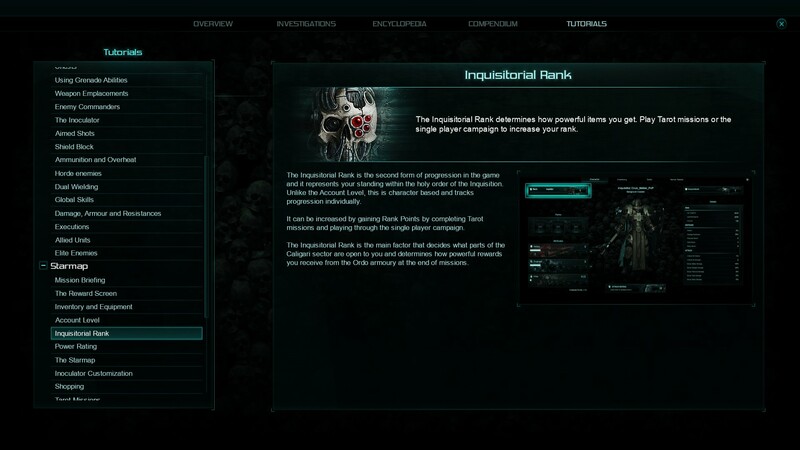 I've been playing only 8 hours in total, and my inquisitorial rank is level 8. You have to do the specified missions in order to properly rank up. In order to obtain more powerful items you have to increase your inquisitorial rank. I hope this helps you. Be sure to jump into discord and ask questions. This video in the link below really helped me understand the new system. I did watch Hydra's video, and understand there are certain missions which progress your character faster. I also recognize that it's likely a bit nebulous at this time due to the stage of the game's development. I still feel that if I complete a ton of "regular" missions, kill of a bunch of enemies, etc. that I should get EXP for that. If the "regular" missions don't do anything, why even have them? I just feel that if a do a few missions right at or a little above my level, I should see my rank increase. Yes at the moment, getting a skill point takes too much time. And you get so little for a skill point (1.5%, 150 hp). I hope they fix this with the next patch or a hotfix. Please dont purge me for this but ... i would like to see everting more in detail like in Diablo 3. There i said it. That means i would like to see my stats in detail like warpdamage , heatdamage , resistences , hp regen , supression regen and so. I also would like to see how much rank-xp i get from a mission the only thing i see is account-xp but the number dont fit with the account-xp i recieve at the end , in the misson log stand 600 and i only get 250 - 300 , a bug ? You should be able to see your detailed stats on the character page when you are on the bidge of your ship. I have the same experience that I get far less account-xp than the mission states I should get. Of course, this makes progression (and getting skill points) very slow. Yeah just found it but its a littlebit iretating that the stats on a serperate page from the inventory. So basicly the normal mission give you nothing but account-xp to get skillpoints and fate for tarot , the only thing that raises my RANK-level to get better gear are the so called story-missions ? And if do not have a purple blueprint for gear the farming for materials are worth nothing , and crafting is only usefull if you craft the highes tier of equipment because you get loads of green stuff all the time on missions. So i dont fell like iam getting better at all , the progress is so slow that i almost think there isnt any at all. This was my feeling as well. For example, that skill tree looks pretty interesting (and has a lot of stuff on it) but I just can't get enough skill points to actually explore it or notice any impact on my characters. The account level versus inquisitor level is also interesting, knowing myself with games like this I will probably really enjoy messing around with new characters. Not sure how this system will make that enjoyable. Level 20 in 1 day, the grind is not too much, the account level grind might be tedious though. Still trying to work out what the hurry is :S. I have 4 char's running and all on lvl 8+ (pl around 250). As Sergeanscrved said 48 hrs played is more than enough time to cap one char. I know there will be changes soon, but if you think they will be all give and no take think again. Can you please tell everyone how long it should take to cap? We have hopefully 4-5 months without a wipe, then many years of game play with 3 classes/9 sub classes to play. Sure 20 will not always be the cap, but will hurt if/when it is increased if after last wipe. I know many people don't like alt's or only solo(i think grouping is faster if good) so everyone will take different time played but once you cap and get top gear its a lot more boring/grindy. Given the size of the skill tree I would be disappointed if the cap stayed at 20, there are a lot of cool things in that tree that I would like to see implemented for my builds. Perhaps what my issue is lies within the fact that playing "regular" missions doesn't seem to do much of anything, it very slowly levels the account, gives some gear, and some money/fate. That's about it--some of these missions are just as challenging or more so than a tarot mission, which seems to be the only way to move forward with any expediency. Making a solid end-game is the key to any game's staying power. It seems like D3 is a bad word around here but they figured out a pretty engaging end game setup over there. Now it's all about getting to cap at level 70 then enjoying the loot farming and content from there. This map appears to be huge, and will have some awesome potential for capped characters to still have a lot of fun, I'd just like to see more result from playing a ton of missions than some kinda lame loot drops.